I’m not a very good juggler. I find it very stressful, not knowing what to juggle first! When “things” are thrown at me to add to my jigging act, I must say my anxiety increase which makes my juggling not so impressive! Time is a huge factor in juggling… Juggling that alone can be a challenge! I am still learning to juggle. Caring for elderly parents, looking for a new job, spending time with new grand babies, writing a book, and being present to all that life has to offer, all while trying to enjoy moments daily is a juggling act for me. 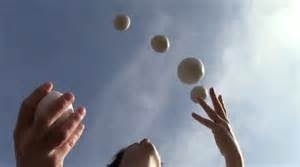 I’m not fond of juggling, but I certainly admire these who do it well! Are you a juggler? What kinds of things do you juggle daily? In awe of those who juggle without dropping anything ! Categories: illisions, inspiration, life | Permalink.